If you read my blog regularly you will know I am currently working my way through the lush haircare products in order to find the product that I not only love but also suits my hair best. 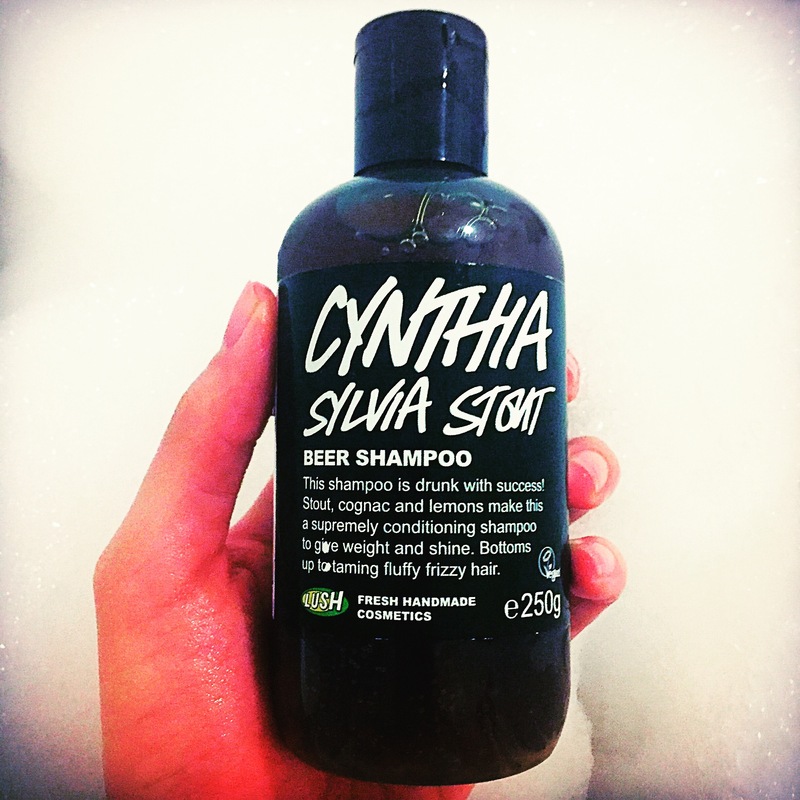 The product that I decided to try next in this mission of mine was the Cynthia Sylvia Stout shampoo. At first glance this shampoo really doesn’t look all that appealing due to its dark brown murky colour. If I was just going to pick a product off the shelf by its appearance this would probably be one of the last I picked, due to that fact I’m much more attracted to products that are bright in colour! But I’ve learnt with lush products to never judge a book by its cover so decided to give this shampoo a go. Containing both Stout and Cognac oil this shampoo has a very boozy element to it. I personally not only hate the taste but also hate the smell of beer and seeing as the main ingredient in this shampoo was stout I soon realised it was going to be pretty unlikely that I would like the scent of this shampoo. Lush have however added several ingredients into this shampoo to complement the boozy scent including lemon juice and lemongrass oil. On first sniff of this shampoo I found that my fears were correct and I really could not stand the scent of this shampoo. This is just down to my personal taste in scents and when I ask my partner what he thought he said he loved the scent. Have you tried this shampoo? Did you like the scent? The Cynthia Sylvia Stout shampoo is designed to be a super conditioning shampoo. It is also made to add weight and shine to the hair as well as taming fluffy and frizzy hair. You really only need a small amount of this shampoo as it lathers up very well. After using this shampoo I found my hair had a lovely shine to it and after a few uses I also found that it did indeed help to tame my very frizzy hair. Overall although the scent of the Cynthia Sylvia Stout shampoo really isn’t for me, I did find that this shampoo worked very well and was very efficient in adding shine to my hair. If you fancy trying this shampoo please note that it is currently an online exclusive meaning it is not avaliable in stores. Let me know if you have tried this shampoo or if you have another shampoo that you love to use from lush! Top Tip – if you have dyed hair be careful as this shampoo my strip you colour due to the lemon juice it contains. Ingredients – Stout, Water, Ammonium Laureth Sulphate, Fine Sea Salt, Lauryl Betaine, Propylene Glycol, Benzyl Alcohol, Fresh Organic Lemon Juice, Cognac Oil, Lemongrass Oil, Yeast, Balsamic Vinegar, Citral, Geraniol, Perfume, Methylparaben, Propylparaben.